Crime scene investigators have roped off the area around a Golden Gate apartment building for an investigation Thursday morning. 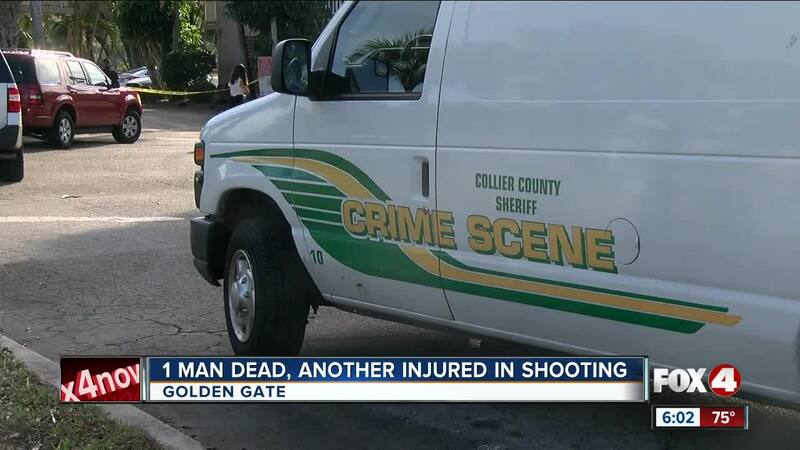 COLLIER COUNTY, Fla. -- Crime scene investigators have roped off the area around a Golden Gate apartment building for a fatal shooting investigation Thursday morning. It's happening in the 4000 block of Golden Gate Parkway, just off Collier Boulevard. The Collier County Sheriff's Office says they arrived to the scene after 2:30 a.m. to find two men shot. One victim died at the scene and the other was trauma alerted to the hospital. The sheriff's office has identified the man who died as 25-year-old Armando Castillo, who lived at the shooting location. Investigators interviewed several people at the scene, but there are no suspects in custody. A witness at the scene tells Fox 4 that more than a dozen shots were fired. "It was the sound of shots, it was just scary because you hear about 8 to 10 shots, and this person crying out for help, and then you don't hear them no more, and then you just hear 8 or 10 more shots after. All the worst scenarios are running through my mind. I wanted to go out and help, but at the same time I was thinking about my children. They were scared," says Joel Figueroa. This is already the third homicide investigation in Collier County this year. Early Tuesday, an Immokalee man was found dead in a home due to a stabbing . Also on Tuesday, a Naples woman was found dead in her home , a victim of a homicide.